A magnificent birds eye view of 1920s Paris. 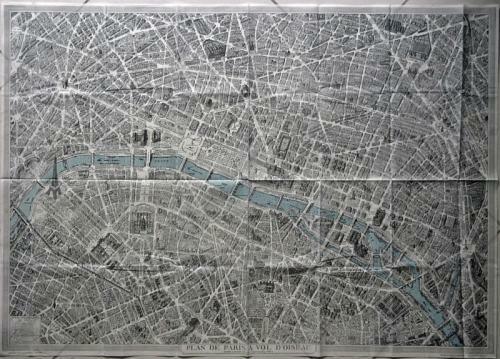 The map features an artistic elevation of all streets, buildings and famous architectural monuments. Features include the old market off the Hlle, and the neigborough of what is now Beauborg as well, we can see the the old wine market of the left side of the Seine river wich are now an university (JUSSIEU) , and of the right side wich are now a park and a cultural area. There is also the old railway station of Montparnasse which is now the higest building in Paris, the tower Montparnasse. The map is on a material like oil cloth, or synthetic . The map was folded but now has been stored in role. The color is original - no stains , no discoloration - The condition is excellent.